Every time my girls visit the playground, they take at least a few turns down the slide. My kids love the rush they feel as they soar down the slide's surface. While it's fun, the slide also supports child development in many ways. Discover the benefits of the slide as you encourage your kids to play, learn, and grow on the playground. To navigate the slide successfully, our kids must steadily climb the ladder, sit confidently at the top, and release themselves to fly down the chute without falling off. These actions strengthen our kids' balance and stimulate the vestibular apparatus, part of the inner ear that's responsible for equilibrium. With better balance, our kids can stand, bend, walk, and move with confidence as they walk, run, and play. When my girls were toddlers and first starting to slide, they only had enough strength to climb a short slide, and they could only reach ladder rungs that were set close together. As they practiced climbing the ladder and sliding, though, they developed more hand, arm, leg, and body strength and flexibility. Now, my kids can tackle bigger slides with ease, and the strength and flexibility they have gained help them avoid injuries and give them confidence as they play sports and walk, run, and move in daily life. For years, my girls have met new friends during every playground visit. I love watching them develop friendships and social skills, especially as they play around the popular slide. Here, they learn how to take turns, share, and put others first. Plus, they develop awareness of others and learn how to be patient with kids who may move slowly up the slide because of a physical disability. These social skills are invaluable during play now and will be useful for the rest of my kids' lives. With strong hands and finger muscles and honed fine motor skills, our kids can grasp a pencil, doorknob, or tools. 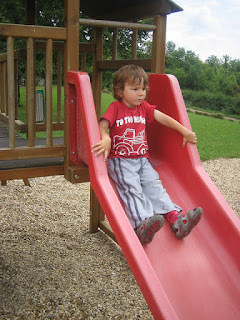 They develop these skills as they grasp the rungs of the ladder and the sides of the slide. Watch your kids the next time they slide, and see for yourself how sliding hones grip strength. As a toddler, my older daughter would always fall on her bottom at the end of the slide. It took her a long time to develop spatial awareness and realize that she needed to put her feet down to stop herself. Spatial awareness does more than help our kids land properly, though. It also helps our kids as they write on paper, complete math problems, and explore science concepts. Climbing the slide's ladder requires our kids' eyes, hands, feet, and legs to work together. Through these actions, their coordination improves, equipping them to move their bodies properly throughout the day as they feed themselves, walk, run, and play. At least 60 minutes of physical activity each day can help our kids maintain a healthy weight. Like most kids, my girls are more eager to get active when they have fun, which is a great reason to use the slide. It's a fun playground activity that keeps our kids moving! The next time you watch your kids on the slide, remember that this fun activity helps them develop in seven important ways. What other benefits have your kids gained from the slide?